Joshua Tree Skin Care offers a collection of herbal chalks and organic healing salves designed for those who lead an active outdoor lifestyle. Originally established in a small town outside of Joshua Tree National Park, Joshua Tree's healing salve immediately gained a loyal following among the rock climbing community. As the word spread to cyclists, runners, hikers, skiers and gymnasts, Joshua Tree added additional items to keep their customers outside, on the go and doing what they love. From its new home in Southeast Michigan, Joshua Tree's team of on-the-go climbers, cyclists, runners and skiers continues to research and develop potent herbal products that heal skin after tough workouts and protect it from the effects of harsh natural elements. "Joshua Tree Salve is our cornerstone product and the reason Joshua Tree exists today! Our first batch of salve was handed out in Joshua Tree National Parks Hidden Valley Campground 10 years ago! It is the most potent and effective treatment for beat up skin that the rock climbing world has ever known!" Joshua Tree Salve is an organic, unscented, skin-healer that is effective in treating flappers, gobis, blown tips, scrapes, cuts, and abrasions. Created using a blend of essential oils, freshly extracted from the finest organic herbs, Joshua Tree Salve moisturizes and promotes healing without softening calluses that the body produces for protection. Designed to heal any skin irritation without softening the skin! Why no softeners??? Because a healthy callus is your body's own natural protection, and it hurts when they get soft and peel! Chalk is going to dry out your hands. That's it job, right? Well, minimize the harsh effects of chalk while stimulating the mind with Herbal Chalks. These ultra grind chalks have the friction to get you through the crux, with an added kick to put your mind back in the action. 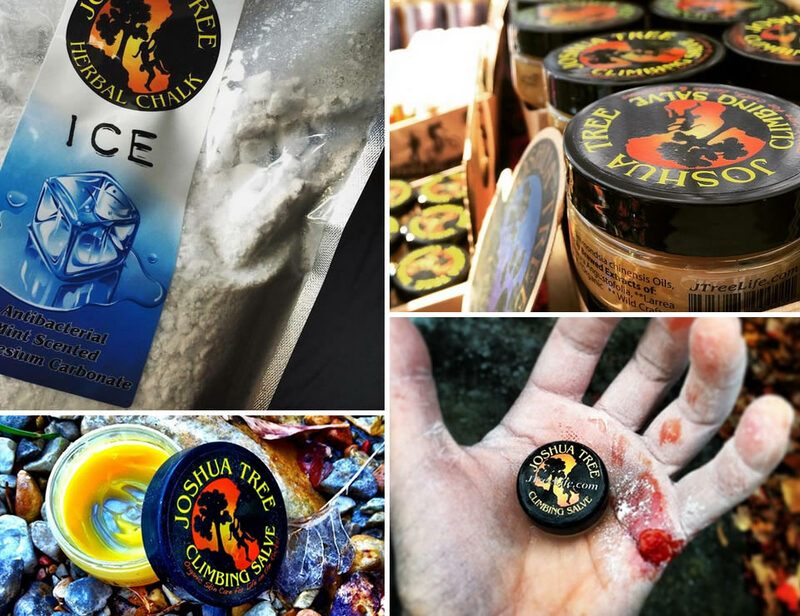 Joshua Tree's range of chalk includes Ice, Fire, Flower Power and Plain flavours with organic extracts such as menthol. Sooth your sore finger tips, worn thin from days of throwing yourself at a rock, so the last pitch is as fun as the first!